Heat butter and olive oil on low. Add shallot, garlic, and sage, and cook until sage goes brown and crispy. Add rosemary and cook, stirring, for another minute or two. Cut the baguette into pieces about 1 to 1 ½ in. square. Place a layer of bread, cheese and shallot-herb mixture in the bottom. Then top with more bread, more cheese, and more shallots and herbs, repeating until everything is used up and the pumpkin is full. Squish it down to compress the bread and cheese as much as possible. Then pour stock over it until the bread and cheese is well-saturated. Replace the pumpkin lid. Bake at 350°F for 2 to 2 ½ hours. 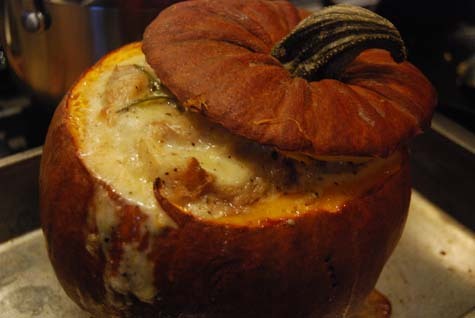 You want the pumpkin flesh soft, but not mushy, and you want to take it out of the oven before the structure collapses. Scoop out the pumpkin flesh from the sides to serve.